This is the photo we submitted to the Houghton Star when we ran Cuzco for Homecoming King. 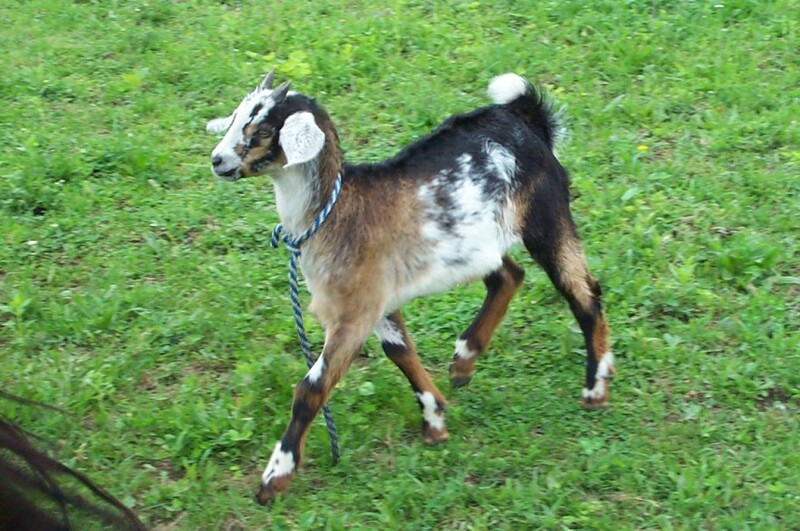 Look at that royal strut! I think it’s obvious why he won. Today is Cuzco’s ninth birthday, and it brings back memories of how we found him. 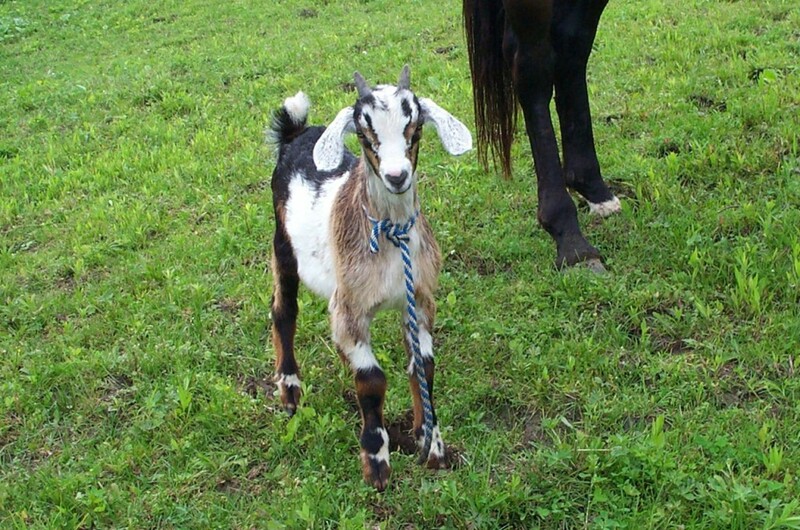 This is the very first photo we ever took of him, and it was about a week before we bought him from a farm near Varysburg, NY. He’s the tiny speck closer to his mother. His sister is in front. Phil and I were driving home from our anniversary celebration at Six Flags Darien Lake when we passed a lovely farm with goats. Somehow I spotted this tiny baby way off in the distance that had the most amazing coloring. I pulled into the farm so fast I nearly got in a wreck. I was sure that a goat this pretty would be far beyond our budget, but I was determined to ask. I banged on a lot of doors and hunted through many barns and tool sheds before I located the farmer. His price? $25!!! The cheapest goat we had looked at yet, and by far the most stunning to look at. He was with his Alpine mother and had a twin sister who wasn’t quite as pretty and was not for sale. The owner raised milk goats and was keeping all the female offspring. Lucky for us the pretty one was a male. This is the first photo we took of Cuzco after we bought him. 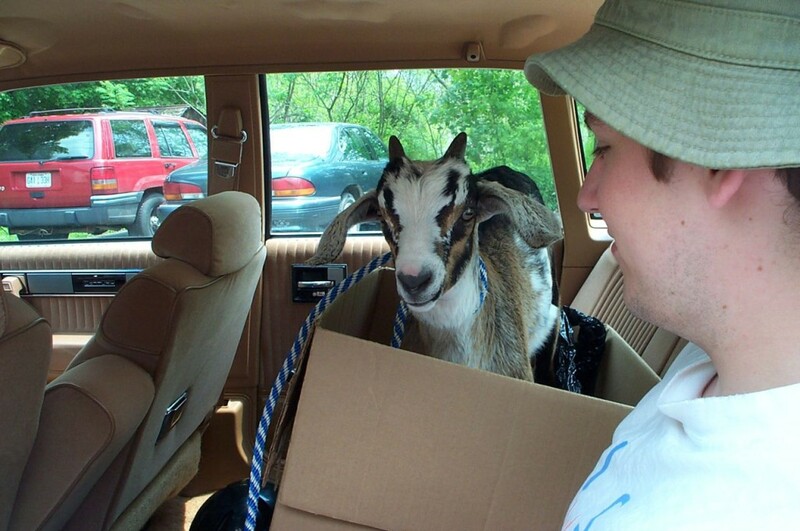 Phil rode with him in the back seat so he wouldn’t jump out of the box. We had even managed to name him by the time this photo was taken. Poor little thing was shaking like a leaf. He had never been handled before and suddenly he’s whisked away from his family and friends, banded, poked with a needle, and shoved into a car with a couple of strangers. It took him a few weeks to get over his fear of people, but it’s amazing what a little singing and cuddling can do. Not to mention treats. Lots of treats.